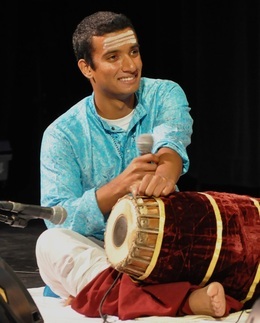 Vignesh Venkataraman, a graduate student at Stanford University, is a mridangam artist hailing from Umayalpuram Sri. K. Sivaraman’s school of music. Vignesh was initiated into playing mridangam by Sri. Anand Iyer, also from the same school. Over a period of 5 years, Vignesh traveled to India every summer to undergo advanced training under the tutelage of Umayalpuram Sri. K. Sivaraman.